Looking for the perfect gift for a birthday, anniversary, Christmas or just as a treat? Our vouchers make a great present for that special someone who loves to travel. 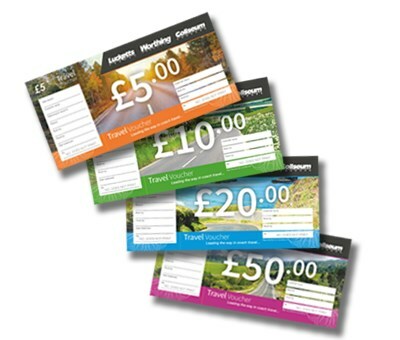 Available in denominations of £5, £10, £20 or £50, our travel vouchers can be used towards any of our days out, theatre trips, short breaks or holidays. You can purchase gift vouchers by calling us on 01329 237000 or send an email to holidays@lucketts.co.uk. Or, pop into our travel shop in Broadcut, Fareham. Valid for one year from date of purchase, unless otherwise specified. When redeeming vouchers by phone, your booking will be held until we recieve your voucher via post or in person. If posting your vouchers to us, please ensure that your booking reference number is included. We cannot be held liable for any vouchers that do not reach us. If the cost of your purchase is less than the value of the voucher, we will hold the remaining credit on your account for future use. Cannot be redeemed online or via our agents. Gift vouchers cannot be exchanged for cash. Because the vouchers are treated as cash, we cannot refund or replace any vouchers that are lost or stolen.